Ship's ladder up to the roof. 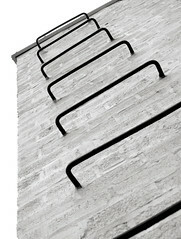 This steel rung ladder provides access from the upper level terrace to the main roof. The steel rungs are anchored into the brick masonry.